Compiled by: Larry Walker, Jr. Left-wing pundits are claiming that the Bush tax cuts were for the wealthy, which is simply not true. Next year when the 10% tax bracket disappears, and tax rates return to pre-2001 levels, will represent an across the board tax increase affecting every American. In addition, the child tax credit will return from $1,000 (per child under age 17) to $500 representing a tax increase for everyone who has children, not the wealthy. The fact is that the Bush tax cuts applied to every American at every level of income, and when they expire taxes will rise from the bottom up. In 2011, if you make over a nickel in taxable income, your taxes will increase a minimum of 9%, and as much as 50%. 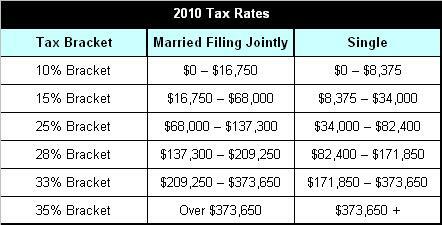 Since our tax rates are progressive, taxes on the first $16,750 for couples ($8,375 for singles) will increase by 50%. Taxpayers who make under $8,375 in taxable income will see the largest tax increase at 50%. Middle income earners will see their taxes rise by no less than 9%. The contention that the Bush tax cuts only affected the wealthy is a bald-faced lie. Similarly, the contention that Obama’s tax increases will only affect the wealthy is nothing but a fairy tale. Americans are educated and can comprehend income tax tables. 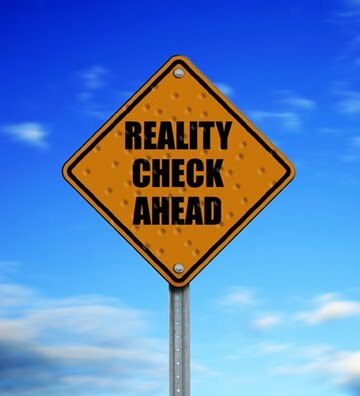 You can choose to believe whatever you want, but reality should not be optional. Nickel over at fivecentnickel.com has projected how the 2011 income tax brackets may look. The commentary below is attributed to Nickel. I have retouched his 2011 table (below), and added the 2010 table (above) for comparison. Income tax bracket changes for 2011 – In case you weren’t aware, the Bush tax cuts of 2001 and 2003 are set to expire at the end of 2010. Thus, if Congress doesn’t act, the relatively low income tax rates that we’ve been enjoying (hah! enjoying?) will soon be a thing of the past. They will be replaced by the pre-2001 tax brackets. Capital gains tax changes in 2011 – Beyond the increased federal income tax brackets, the capital gains tax rates will also be changing (and not for the better). The top rate for long-term capital gains will be rising from 15% to 20%, and the 0% rate for those in the lowest tax brackets will be replaced by a 10% long-term capital gains rate. Why worry about 2011 income tax changes? – Since the 2011 tax year is so far off, you might be wondering why we’re even talking about it right now. Well, as I noted above, the time to be planning for things like this is right now – before the changes go into effect as these potential income tax rates have the potential to take a big bite out of your savings account. What sort of planning should you be doing? I can think of several things off the top of my head. For starters, if you’re in a position to accelerate income from 2011 into 2010, you might want to do so. In many cases this is easier said than done, but it’s worth exploring if you’d like to shield your income from the potentially higher rates. Also, if you’re anything like me, you may wait until the end of the year to make your charitable donations. If so, then by waiting just a few more days (until January 1, 2011) to write that check, you could net a substantial tax savings. While you’d have to wait longer to claim the deduction, it might be worth it. Similarly, if you anticipate selling investments to generate cash during 2011, you might consider moving that up to the end of 2010 to get in on the (presumably) lower capital gains tax rates.